This book is based on the George Fisher Baker Lecture given by Jean–Michel Savéant at Cornell University in Fall 2002. Chapter 1. Single Electron Transfer at an Electrode. 1.2 Cyclic Voltammetry of Fast Electron Transfers. 1.5 Successive One–Electron Transfers vs. Two–Electron Transfers. Chapter 2. 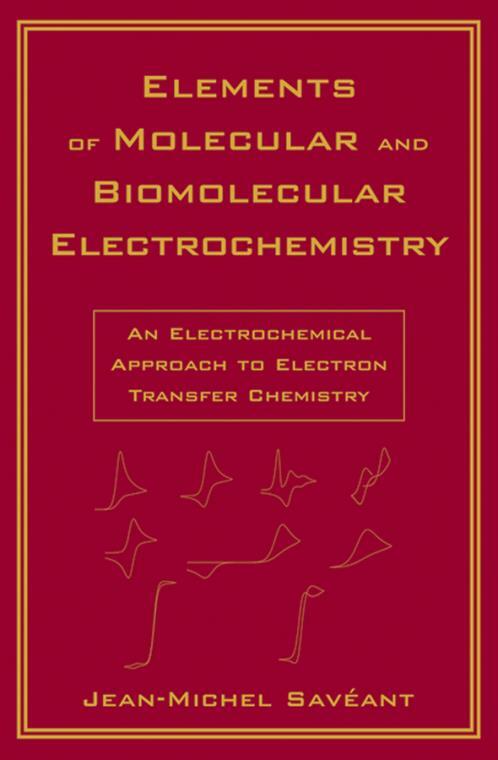 Coupling of Electrode Electron Transfers with Homogeneous Chemical Reactions. 2.2 Establishing the Mechanisms and Measuring the Rate Constants for Homogeneous Reactions by Means of Cyclic Voltammetry and Potential Step Chronoamperometry. 2.3 Application of Redox Catalysis to the Kinetic Characterization of Fast Follow–up Reactions. 2.4 Product Distribution in Preparative Electrolysis. 2.5 Chemical Classification and Examples. 2.6 Redox Properties of Transient Radicals. 2.7 Electrochemistry as a Trigger for Radical Chemistry or Ionic Chemistry. Chapter 3. Electron Transfer, Bond Breaking, and Bond Formation. 3.3 Interactions Between Fragments in the Product Cluster. 3.4 Stepwise vs. Concerted Mechanisms. 3.5 Cleavage of Ion Radicals. Reactions of Radicals with Nucleophiles. 3.6 Role of Solvent in Ion–radical Cleavage and in Stepwise vs. Concerted Competitions. 3.7 Dichotomy and Connections between SN2 Reactions and Dissociative Electron Transfers. Chapter 4. Molecular catalysis of Electrochemical Reactions. 4.3 Supported Molecular catalysis (Immobilized catalysts). Chapter 5. Enzymatic Catalysis of Electrochemical Reactions. 5.3 Immobilized Enzymes in Monomolecular Layers. 5.4 Spatially Ordered Multimonomolecular Layered Enzyme coatings. 6.1 Single Electron Transfer at an Electrode. 6.2 Coupling of Homogeneous Chemical Reactions with Electron transfer. 6.3 Electron Transfer, Bond Breaking, and Bond Formation. 6.4 Analysis of Supported Molecular catalysis by Rotating Disk Electrode Voltammetry.